What a mess. Get it together, Arizona! They supposedly will be dropping some votes tonight so we shall have to see. McSally is leading but only by about 17,000. The two congresswomen are running to fill the seat vacated by the retirement of Republican senator Jeff Flake. 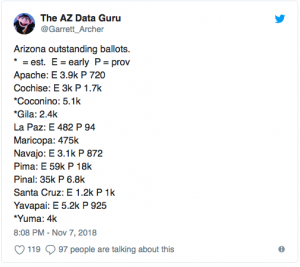 The plaintiffs in the suit are the separate Republican Party divisions for the counties of Yuma, Navajo, Apache, and Maricopa, and the complaint deals with the signature verification process for mail-in ballots.